How to tag hyperlinks with Tripolis Dialogue? Home » Portfolios » How to tag hyperlinks with Tripolis Dialogue? Within Tripolis Dialogue it is possible to use hyperlink tagging, including auto tagging. The benefits of tagging your hyperlinks can be found in reporting and campaigns. In Reporting, hyperlinks with the same tags are combined in the tags graph, also when aggregating mailings for reporting. In campaigns, they can be used in click filters and these will remain working when content is refreshed. 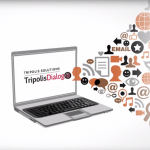 Check out our Knowledge Center to find out all the possibilities Tripolis Dialogue has to offer!